The waterwheel was seen as the most important power source in the world, from the Middle Ages to the end of the nineteenth century. When smaller streams became saturated, medieval engineers turned their attention to larger rivers, eventually leading to the development of the hydropower dams that still exists today. Lesser known are the intermediate steps toward that technology: boat mills, bridge mills and hanging mills. Boat mills had already appeared in 6th century Italy and spread all over the world. Most of them remained in use up until the end of the 1800s, with some of them surviving well into the 1900s. Until recently, "boat mills", also known as "ship mills" or "floating mills", were largely thought of as a curiosity, a mere footnote in the long history of water power technology. Today some historians think that they were almost as widespread as windmills - although it should be noted that windmills, contrary to popular belief, were less common than watermills. The first monographs of boat mills only appeared in 2003 and 2006 (see sources). They contain, among many other new facts, the discovery of three tiny ship mills on a famous medieval painting from 1435 ("Madonna of Chancellor Rodin" by the Flemish painter Jan van Eyck). Nobody had noted them before, or weren't cognisant of exactly what they were. Granted, boat mills are curious things. Some look like paddle-wheel riverboats, but in fact they are exactly the opposite. A waterwheel can be used in two ways: to create energy from moving water, as is the case with the water mill, or to apply energy to water with the result of motion, as is the case with a paddle-wheel boat. The boat mill has the outside appearance of the latter, but it works just like a water mill. Basically, a ship mill is a water mill (waterwheel + milling house) built on a floating platform, moored to the river bank or anchored in the stream. The flowing water turns the water wheel, which in its turn drives the milling machinery. Ship mills could be used as single units, or fastened together side by side. Why build floating water mills when you can just as well construct a fixed water mill on the bank of a river? There were several good reasons. Although water is a much more reliable power source than wind, you cannot always count on it. Rivers rise and fall with the seasons and with the prevailing weather, while the axle of the water wheel remains at a fixed height. On smaller streams this variability could easily be mitigated by creating a small dam and sluice gates, forming a mill pond to even out natural flow conditions. An overshot wheel could also be used, especially in hilly regions. This wheel receives water from above via some kind of aqueduct and is more efficient (50 to 65%) than an undershot wheel (20 to 30%). However, constructing dams and sluice gates would be much more difficult to achieve on a stream 100 metres wide and 10 metres deep. Overshot wheels could not be used. Since the water level in many large rivers could vary substantially, a fixed watermill on the bank of a river could thus easily end up with its blades above the water, rendering it useless. Conversely, rising water levels could partly or completely submerge the wheel, again rendering it useless (contrary to a modern turbine, which can operate fully submerged). Ship mill on the Mura in Slovenia, source. Even less extreme variations of the water level could seriously decrease the efficiency of a fixed water wheel. An undershot wheel derives its power entirely from the impulse of water, not complemented by gravity as is the case with an overshot wheel. In combination with a mill pond, the water could be directed at an optimal angle to the undershot wheel in order to obtain maximum efficiency. On a large river, where no mill pond was available, this was not possible - further decreasing the already limited efficiency of the undershot wheel. Floating watermills solved these problems. They simply followed the water level, keeping the undershot wheel always at a continuously ideal position. The result was a power source that was available 24 hours a day and 365 days per year (with the exception of extreme weather events). Furthermore, ship mills could be located at other parts of the stream where water velocity was higher than close to river banks, increasing their power output. Last but not least, ship mills also overcame the problem of overcrowded river banks, an especially important consideration for cities. Basically, there were two main types of boat mills. One type was composed of two hulls with a water wheel in between, while the other type consisted of one hull with two waterwheels on both sides (or, sometimes, one waterwheel on one side). The boat mill with two hulls, somewhat resembling a catamaran, was by far the most efficient and powerful of both models. The two hulls channelled the water onto the wheel, increasing the impulse. A boat mill with a single hull did exactly the opposite. Furthermore, the floating mill with two hulls (illustration on the right, by Johann Matthias Beyer) could support much larger wheels than the type with one hull (illustrations on the left, from the "Encyclopédie Diderot"), again increasing the power output. Thirdly, the double hull allowed for a system of control gates to regulate the amount of water hitting the wheel, thereby making it possible to better control the speed of the machinery inside the milling house, or to stop the wheel altogether. This system also protected the wheel against driftwood. Finally, a boat mill with two hulls was also more stable. One of the hulls was much wider than the other one. It housed the millling machinery (mill stones and gears), the grain to be ground, and - in the case of larger ship mills - the boat miller residence. In the case of smaller ship mills, this house stood on the bank of the river. The smaller pontoon only served to carry the axle. The main hull and the pontoon were connected at the front and the rear with strong beams. Balancing the floating mill was done by loading stones in the pontoon. The large hull was always on the side of the river bank for easy accessibility - this meant that ship mills with two hulls were designed with a specific location in mind: the left or the right bank of the river (on the aforementioned painting by Jan Van Eyck, this fact was overlooked by the artist). If it was moored on the river bank, the mill was accessible by a stone or wood bridge or gangway. Sometimes pack animals were used to deliver the grain and to take away the flour. If the boat mill was located midstream, it was only accessible via small boats. Boat mills, which were built almost entirely out of wood, could be impressive structures. Generally, they were 10 to 15 metres long, while the longest ship mills described measured 20 metres and more. The large hull was usually 5 to 8 metres wide, the pontoon 2 to 3 metres. Both were mostly built in a rectangular form. A ship mill could be more than 6 metres tall and some had two or even three floors. However, while some floating mills were huge and outstandingly crafted, others were rather small and sometimes very crude contraptions. The life expectancy of a boat mill could be between 30 and 50 years, with the wheel itself lasting for a decade. But some ship mills did not last even that long, rotting from the inside or simply falling apart. While conventional water mill wheels were seldom wider than 1 metre, the wheels of ship mills with two hulls could be up to 6 metres wide, with the axle up to 10 metres long. Medieval engineers explored the limits - wooden wheels could not be built larger than this if they were to retain their strength. The huge wheels had a diameter of about 5 metres and turned at 3 to 5 revolutions per minute, depending on the velocity of the stream. They delivered between 3 and 5 horse power at the shaft. Ship mills with one hull could not support these wide wheels and delivered much less power. Among the lesser common types of boat mills were those with two water wheels in between the main hull and the pontoon, allowing them to operate two mills at the same time. They required very long axles, which were not always easy to find (illustration below). Placing the two wheels one after the other resolved this, at the expense of decreased efficiency. From the 15th century onwards, many conventional water mills started performing tasks other than milling grain, but most boat mills did not. Almost all of them were corn mills. There were a few exceptions. Karel Broes, the Flemish author of the 2003 monograph, lists a few floating paper mills, sawmills, fulling mills, oil mills, polishing mills, minting mills and cotton mills. Some of the more recent ship mills ended their life as an energy source for power generation. "In Liang-chiang there were many ship mills, which work on the same principle as the water raising wheels, and are all anchored in the rushing water. The operations of grinding, pounding, and shifting (bolting) are all carried out by the use of water power. The boats make a noise 'ya-ya, ya-ya' incessantly". Diderot described a stationary tugboat (below). Few inventions from Antiquity can be dated as precisely as the ship mill. In 536 or 537 AD the Goths besieged Rome. In an attempt to starve the Romans, they cut the 14 aqueducts that delivered water to the city. This did not deprive the Romans of drinking water because the Tiber flowed through the walled city. But the aqueducts were the power source for the water mills that ground the grain for the whole city. "When the water was cut off and the mills stopped, and cattle could not grind, the city was deprived of food, and provision could hardly be found for the horses. But Belisarius, an ingenious man, devised a remedy for the distress. Below the bridge across the Tiber he extended ropes, well-fastened across the river from bank to bank. To these he affixed two boats of equal size, two feet apart, at a spot where the current flowed with the greatest velocity under the arches; and placing mill-stones in one of the boats, he suspended machines by which they turned in the water-space between them. He also contrived, at certain intervals on the river, other machines of the like kind, and these being put into motion by the force of the water, drove as many mills as were necessary to grind food for the city." After that, the Roman empire did not last much longer - the Goths took Rome in 562 - but the ship mill would remain in use for another 1,400 years, with the last one only disappearing in the 1990s. Remarkably, during all those centuries, boat mills hardly changed. Those that could still be seen during the second half of the 20th century looked very similar to those illustrated in the Middle Ages (no earlier images of ship mills have survived). After its initial success in Rome, the ship mill became a common sight on the Tiber and quickly caught on all over Europe. During the 6th century they also appeared in Switzerland (Geneva) and France (Paris and Dijon). During the 800s, boat mills showed up on the Rhine in Strasbourg (France) and Mainz (Germany). At the end of the tenth century, they were noted on the Kur in Georgia. They reached Venice and the Balkans in the 1000s and Spain in the 1100s. Toulouse (France) had at least 60 ship mills on the Garonne in the 12th century, milling all the grain for the city. Paris counted 70 to 80 boat mills on a one mile stretch of the Seine in the 1300s. In 1493 there were 17 floating mills on the Rhône at Lyons, growing to 20 by 1516 and to 27 by 1817. The Elbe, flowing through Germany and the Czech Republic, once counted 500 boat mills. There were also hundreds of ship mills on the Danube: 62 in Vienna (Austria), 88 in Budapest (Hungary) and a non-specified amount in Slovakia, Croatia, Serbia, Bulgaria and Romania. The Mur, a river that flows mainly through Austria and Slovenia, had over 90 boat mills. Ship mills can even be seen on 17th century city plans of Moscow. In her 2006 monograph, Daniela Gräf could find proof of almost 700 specific locations, mainly on the Seine, Loire, Garonne, Rhône, Rhine, Weser, Elbe, Oder, Danube, Po and their tributaries, on which one or more boat mills have existed at one time or another. The total amount remains unknown for now. Floating mills did not show up everywhere, though. The Scandinavians and the English never warmed up to the idea. Attempts to build them on the Thames in London failed twice in the 16th century and again in the 18th century. The reasons for this are not well known. In Flanders and in the Netherlands, boat mills never really gained popularity - not more than a dozen were operated from the 15th to the end of the 17th century. In this case the cause is clear: the flow of the rivers in the Low Countries is too low and water power in general was of limited use. Because the region had much better wind conditions, it became an important center of windmill technology. Boat mills appeared in the Islamic world at the end of the 9th century, where they were employed along the Tigris and Euphrates rivers. These large floating mills were equipped with four stones and could each produce around 10 tonnes of flour per 24 hours. Each mill could grind grain for around 25,000 people, which means around 60 of them were needed to feed the then estimated 1.5 million people in the Baghdad. Nothing yielding this scale of mechanised corn milling was known in any European country at that time, notes Terry Reynolds in his book on the history of the vertical water wheel (see sources). In 1148, Ibn Jubayr described the ship mills across the river Khabur in Upper Mesopotamia "forming, as it were, a dam". "The stream was very rapid in many parts, so much that it is used for turning the waterwheels which grind and husk rice and other kinds of grain. At first I thought it was a steamboat, and was greatly surprised. A large barge or boat was firmly moored by stem and stern near the side of the river, in a part where the stream ran most rapidly. Two wheels, not unlike the paddles of a steamer, were placed at the sides of the boat, and connected with an axle which passed through it. The boat was tatched over to afford protection from the rain. As we got further up the river, we found that machines of this description were very common." At the beginning of the twentieth century, Worcester made detailed engineering drawings of the ship mills still in action around the Chinese city of Fouchow. These carried four waterwheels on two axles - see the plan on the left. Boat mills also opened up the possibility of generating power from coastal areas and estuaries, because they could be used as tide mills. The first one was described in 960 AD and was located on a canal of Basra in Southern Iraq. It could be that the early ship mills in Venice were tide mills, too, though nobody knows for sure. When a boat mill was used as a tide mill, its wheels would be pushed in one direction when the tide came in, and in the other direction when the tide went out. They could not be used for more than 10 hours per day. Very few of them were built - dams and tidal reservoirs were more common options to harvest tidal energy. Medieval millers quickly learned that the output of boat mills could be increased when they were anchored or moored close to islands, sand banks or man-made structures - most notably bridges. The wide piers and short arch spans of medieval bridges greatly increased the velocity of the stream at these locations. Positioning a ship mill underneath the arches of a bridge or just downstream from it became very popular practice during the Middle Ages. Reynolds notes that when the "Grand Pont", a masonry bridge in Paris under which more than a dozen ship mills were located, was destroyed at the end of the 13th century, it was the owners of the mills who quickly built another (wooden) bridge to facilitate the operation of their boat mills. From this practice came the evolution of the bridge mill, which probably appeared in the 12th century (the first description comes from Cordoba, Spain). Bridge mills did not float - they were built as part of a bridge with the milling machinery built on top of the bridge itself. Unlike boat mills, they required some mechanism to alter the position of the wheel as the water level changed. In most cases the mill was suspended from the bridge by chains which could be adjusted by a capstan arrangement (as described by Zonca, illustration on the left) or a treadmill. Bridge mills had sluice gates to control the flow of water and to protect the wheel against driftwood. From the 16th century onwards, quite a few ship mills were replaced by bridge mills. "The hydropower dam and its adjunct, the power canal, presumably evolved from the boat mill and the bridge mill. The boat mill had been an attempt to adapt the vertical wheel to the natural flow of streams. The bridge mill had been a further step in that direction, but it had also demonstrated that natural conditions of flow could be significantly improved by human artifices. In one sense, the medieval river bridge, when combined with either boat or bridge mill, was a primitive form of hydropower dam, an intermediate step between the unassisted boat mill and the full-scale hydropower dam. Intentionally designed hydropower dams and the power canals frequently associated with them, however, went a step further. The boat mill and, to a lesser extent, the bridge mill had adapted the water wheel to natural stream conditions. The hydropower dam did the reverse. It adapted the stream to the water wheel." A variant of the bridge mill was the "hanging mill" or "suspended mill", which was not suspended from a bridge but from a specially designed structure (bridge mills are sometimes called hanging or suspended mills, too). It worked in a similar manner but did not offer all the advantages of the bridge mill - capital costs were higher and boats were required to access them. Their commonality was their relatively high power output, since they could support multiple waterwheels and could be built much larger than boat mills. Less is known about these suspended mills, and most of the available data is limited to France (the "moulin pendant" above was located at Châtres and was still working in 1910). Three large hanging mills were built in Paris on the Seine during the 17th century. They took care of the water supply for the city, pumping water from the river. The "Pompe du Samaritaine" was built in 1608 and the "Pompe du Pont Notre Dame" - which actually consisted of two suspended mills with a water tower in between - was built in 1670, following a severe water shortage. They had a power output of respectively 8.7 and 18.6 HP. The Pompe du Pont Notre Dame, which was demolished in the second half of the 19th century, is pictured above on a 1756 painting by J.B. Raguenet - note the floating mill just behind the bridge. Large suspended mills (of a different type) were also built outside of France, notably in Germany (where they were called "Panstermühlen") from the 16th century onwards. Beyer describes one with multiple wheels that was 27 metres long, 15 metres wide and 18 metres high - see the illustration below. It was built on the river bank, but contrary to a conventional fixed water mill the wheels could be moved up and down. In the 19th century, yet another type of hanging mill appeared in Romania and Poland (the "Alvan"). Hanging mills were also built in the Far East from the 15th century onwards. In the Japanese mill below, which appears in Broes' monograph, the water axle was lifted by means of a lever construction. Bridge mills and hanging mills had another important advantage over floating mills: safety. Right from the beginning, ship mills caused problems. During heavy floods or storms their moorings often broke. The mills were carried away - sometimes with the people still inside - and smashed into boats, docks, bridges or other ship mills. They could get stuck in the arch of a bridge, damming the river and thus causing the waters to rise even higher. Floating ice could have similar consequences. Ship mills were not built with any means of proper navigation, so when they broke loose they were out of control. They could only navigate in calm weather. Even under normal weather conditions boat mills formed a threat, especially for navigation. A floating mill required very secure anchoring, in order to avoid the accidents described above. Usually the method used was to hammer heavy wooden posts into the riverbed - often angled upstream - on which to fix their chains. These posts were a hazard to other boats, especially when the ship mill had been moved to another location in the meantime. Bridge mills and hanging mills did not pose these risks. 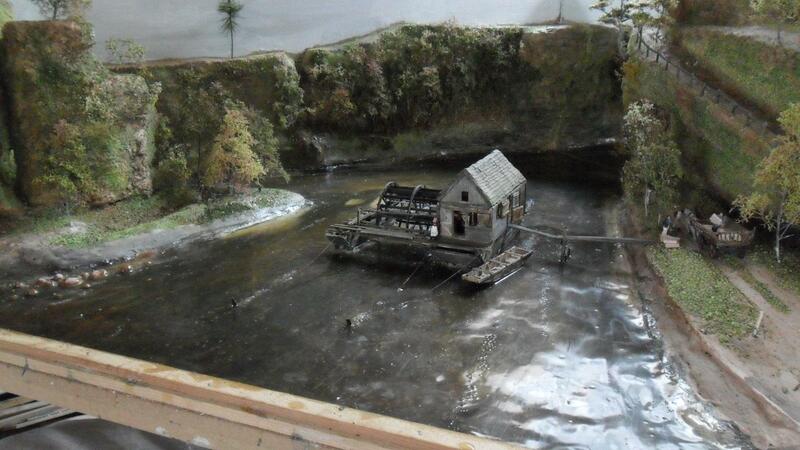 Furthermore, their wheels could be taken out of the water when there were floods or ice, preventing damage to the mill. They were also more stable - another drawback to ship mills was that they sometimes delivered a product of inferior quality, due to the instability of the water. This might explain why most ship mills were only used to grind grain. Finally, bridge mills and hanging mills were also easier to maintain than boat mills. In some regions boat mills were discontinued rather quickly. The 60 floating mills that were installed in Toulouse in the 12th century had disappeared less than a century later. They were replaced by three dams on which 43 fixed watermills were erected. The largest of these was the 400 metres long diagonal Bazacle dam, which was in operation by 1177 and remained the largest hydropower plant for quite some time. However, this drastic and early transition seems to have been an exception rather than the norm. Many more hydropower dams were built, and more boat mills were replaced by bridge mills or hanging mills, but in most European countries and in the near East ship mills remained in use well into the 1800s. The majority of boat mills were discontinued between 1770 and 1870, which is no coincidence. Around 1780, the first steam river boats appeared and river navigation became ever more important. The use of ship mills was restricted by law in Austria in 1770 and in Paris in 1787. The construction of new ship mills was outlawed on the Rhine in 1868. In response to strict regulations in Slovakia at the end of the 19th century some boat mills were converted to fixed water mills on stilts - yet another variation (picture below, by Leo van der Drift). In Paris, only 4 ship mills were left in 1800. The last boat mills on the Seine, the Loire and the Rhône disappeared respectively in 1840, 1842 and 1894. The last ship mill in Cologne was discontinued in 1847. At the beginning of the 1800s, there were still about 20 ship mills active on the Tiber, milling grain for a population of 158,000. At the end of the century, the last one disappeared. On the other hand, Vienna (Austria) still had 55 ship mills in 1870. In China they were used up to the end of the 19th century. On some rivers boat mills could still be seen in the 1900s. During the first half of the century, working boat mills could be found in Georgia (Tiflis, 9 mills operating in 1909), Czech Republic (Lovosice, 1911), France (on the river Doubs, 3 mills operating in 1914), Iraq (Tekhrit, where they were used at least until 1917), Italy (10 boat mills in Verona in 1914, the last one stopped working in 1929), Turkey (1920), Germany (several locations, until 1926), Japan (1933), Slovakia (1937), Hungary (Tiszán, 1940) and Austria (Misseldorf, until 1945). Bosnia had 27 mills left in 1950 with the last one disappeared in 1966. In Romania, 35 ship mills were still in use in 1957, and 8 of these were still working in 1968. Finally, the French historian Claude Rivet found a working ship mill on the Morava at Kuklijn (Serbia) in 1990, which was discontinued shortly afterwards. This seems to have been one of the last working authentic boat mills (check out this interesting video). Since then, around a dozen reconstructions have been built. Ship mill in Serbia, 1990. Picture by Claude Rivals. "Over schipmolens en andere onderslagmolens met in hoogte verstelbare wateras", Karel Broes, Molenecho's, Vlaams tijdschrift voor Molinologie, July - September 2003. There seems to be only one (more or less) publicly accessible copy of this issue, in a library in Antwerp, Belgium. "Stronger than a Hundred Men: A History of the Vertical Water Wheel (Johns Hopkins Studies in the History of Technology) ", Terry S. Reynolds, 1983. Here's where I got the idea. There is no detailed information to be found on boat mills, but Reynolds puts the technology in its context. "Boat mills in Europe from early medieval to modern times", Daniela Gräf, 2006. I could not obtain a copy of this book yet, so I relied on some reviews and the table of contents. It is based on a thesis written in 2003, and must be a valuable addition to the sources mentioned above. "Wheels ex-aqueous and ad-aqueous; ship-mill and paddle-boat in east and west", in "Science and Civilisation in China, Vol. 4: Physics and Physical Technology, Part 3: Civil Engineering and Nautics ", Joseph Needham, 1971. Ship mills in Asia. "Theatrum Machinarum Molarium, Oder Schau-Platz der Mühlen-Bau-Kunst", Johann Matthias Beyer, 1735. "Vollständige Mühlen-Baukunst", Leonhard Christoph Sturm, 1718. "Die Kölner Rheinmühlen I & II", Horst Kranz, 1991-1993. There is also a website. "Le moulin et le meunier. Mille ans de meunerie en France et en l'Europe", Claude Rivals (2000).